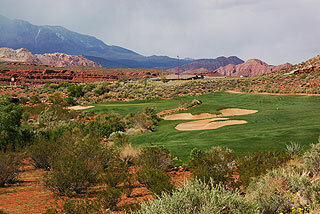 The scenic 45 minute drive from Mesquite Nevada to St. George Utah is amongst the prettiest rides in the country...just one more reason to make the trip to play one of the top courses in the western USA. 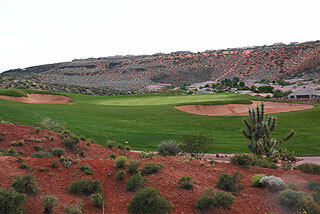 Coral Canyon is just that - an 18 hole Keith Foster championship design featuring a labyrinth of desert washes set amongst the scenic red rock outcroppings of Southern Utah. Its location (and great value - under $90 prime season) makes Coral Canyon a worthwhile day trip from Las Vegas. 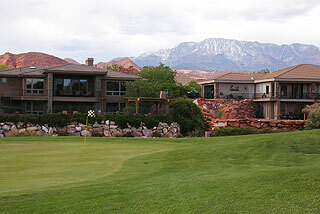 Together with the Entrada at Snow Canyon and the 81 holes of incredible championship golf available in Mesquite - Coral Canyon presents a good case for playing 36 holes, spending a few days, or an entire golf vacation in this venerable golf destination. You will find all the casino action one may want in nearby Mesquite - and the famous parks of Utah, particularly Zion National Park - are in close proximity. Golfers can play a different quality layout every day of the week, and get great value for their money. Particularly for those who have experienced all Vegas has to offer - which is significant - Mesquite/St. George provides variety and a break from all the bright lights and action of the strip. The area is truly a golfer's paradise! 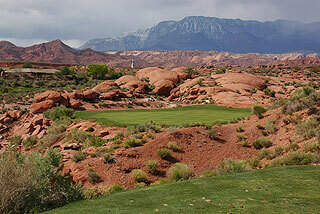 Coral Canyon is a formidable challenge, with its 7029 yards playing to a top slope rating of 137. Five sets of tees allows all levels of golfers to choose a distance that suits their games. The are even 2 sets of "ladies" tees - measuring 5026 and 4125 yards. Shots over and around beautiful desert areas, with ancient lava outcroppings and dry washes lurking, will challenge scratch golfers. Novices and mid-range handicappers can chose alternate tees, allowing a safer haven from forced carries, which are very reasonable to begin with. Play wisely, and it is possible to get in 18 holes with 1 ball - a feat not common on golf courses in this area of the country. Generally speaking, the fairways are generous, providing ample room for minor errors off the tee. The desert spaces are cleaned out exceptionally well, allowing a decent chance for a recovery if you should happen into these areas. It should be noted that Coral Canyon has been voted a " Top 50 Golf Course For Women" by Golf Digest - which alludes to its playablity. On the grounds of this Suncor golf property, are a beautiful grass range with target areas and an ample putting green. There is also a short game area for chipping and for bunker practice. Like the course, the conditioning of these facilities is exceptional. The clubhouse features a 895 square-foot pro shop amply stocked with golf attire and accessories, and a nicely appointed dining area/lounge with televisions and comfortable seating for 66 for dining or refreshments. The covered outdoor patio is spacious and can comfortably handle groups as large as 200 people. A huge barbeque pit and seating that is intimately close to the surrounding mountains, with views of waterfalls and the immaculately landscaped grounds, make this location perfect for golf groups and special events. Everything about this property, including the friendly service, is first class! Golfers will be pleased to find that the course is very well marked - you can trust the yardages on the sprinkler heads, which are measured to the center of the green. A large 150 -yard stake is obvious in the center of the fairway on all the par fours and fives, providing accurate distance to the center of the green, and serving as a directional tool as well. On our round in mid-February, information on the days pin placements was provided for with a sheet posted on each cart. Beginning sometime in March, Coral Canyon will feature the Pro Link GPS - perhaps the most accurate measuring system available. The mid-range handicapper will have to decide between playing from the blues (6515) or whites (5953). The distance on the front nine is negligible, so it might even be a good idea for confident golfers to play from the blues on the front and the whites on the back. With two first time visitors in the good to have fun, we opted for the whites (Back tees on the scorecard - 130 slope rating) right from the start. The opening hole is gorgeous, and a reasonable par five - as long as you can avoid the sand bunkers on either side of the fairway. 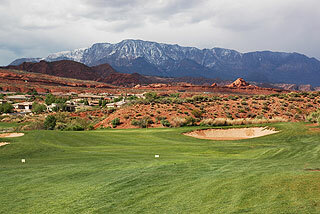 Uniquely, the second is also a par five, and features a narrow fairway streaking between a formidable desert area right and mountain foothills on the left. Pine Mountain makes a spectacular backdrop here. Most golfers will learn quickly, that at Coral Canyon it is necessary to approach the correct portion of the greens, which are double tiered. Land past the hole or on the wrong side of the ridges, and 3 putting will become common. 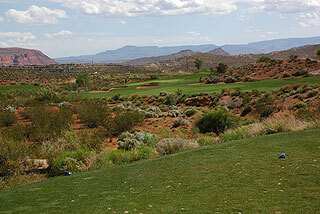 Bunkers short and right of the green complex and a desert carry off the tee make the third hole a testy par three. The mid-range par 4 fourth is simple off the tee, but the approach plays a full club extra as it is entirely uphill. A lay-up is recommended off the tee on the next par four. A shot landing near the 150 will leave the best approach to a downhill, well bunkered putting complex. The sixth is perhaps the prettiest par three on the course, with Pine Mountain again serving as an excellent backdrop. Short is not an option here, and long can also be trouble. Your best wedge game is needed to extract par or better. The fairway is well bunkered on number seven. Aim towards the right side to avoid the ravine left, and hope for the best on this extremely tough (# 2 handicap) hole. The short nature will tempt long hitters to go for the green on number 8, though the more prudent move is to lay up near the 150. A deep bunker fronting the putting surface makes the approach difficult, especially if the pin is up. A long drive bending right to left over the rock wall will cut off significant distance on the closing hole of the front. The best approach is from the left, taking the greenside traps out of play. The backside plays a bit longer and opens with a gorgeous shot from an elevated tee. This is a reasonable carry to a generous fairway, but the approach to the well bunkered green complex is challenging. 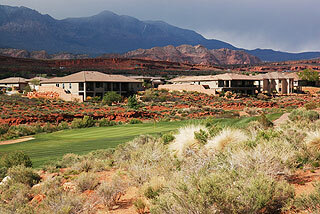 Eleven also demands a carry over desert, with a steep grass slope and bunkers guarding the entrance to the green. Use caution on twelve, as it is very possible to run your tee shot through the fairway into the desert area. A lay up followed by a long second shot is the safest option here. There is 40 yards of grass between the wash and the putting surface, so there is bail out room short. Holes 13 - 18 will give you an opportunity to "air it out", as there are 4 holes of 488 + yards, and the two par three mixed in measure 215 + from the tips. Thirteen is a simple par three, and is followed by the longest hole on the course, the 593 yard par five 14th. Long hitters can carry the traps left and possibly reach in two as this hole plays downwind. 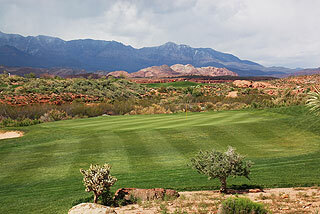 Others should stay to the right center and bargain with the desert wash that sits about 170 yards from the green. On the 15th, your tee shot must land between 2 desert areas, the second one measuring about 130 from the putting surface. At 488 from the tips, 455 from the blues and 403 from the whites, this is the number one handicap. The fairway is wide on the beautiful par five 16th. If your approach can navigate between the two greenside traps, this hole is very score -able. A simple par three on seventeen is followed by a pretty par five that presents the longest carry of the day from the tee areas - which is just over 100 yards from the whites. The approach plays uphill, but a good finish is very possible here.